As much as the iPad has changed the face of portable computing ande-reading, it's hard to believe that it was introduced just two yearsago. It was a big difficultto categorize at first. It was like an oversized iPhone without themobile phone. It was like an oversized iPod touch with 3G networking asan option. With it 9.7" 1024 x 768 pixel display, it was ahigh-resolution platform compared to smartphones and even manynetbooks. And it was utterly unlike the tablets of the day, most ofwhich were bulky Windows devices. At a glance, it's not easy to distinguish the original iPad from today's iPad 2, and it's very likely the same will gofor the iPad 3. The size and shape are just right, and the onlyimprovements to date have been moving to a dual-core processor andadding cameras for FaceTime. Of course, with its larger display, we saw a whole new category ofapps designed to use all that extra space, helping to create a distinctiPad platform that runs the same OS as the iPhone and iPod touch butgives you more room to work. Alan Zisman (Zis Mac): I wasan elementary school computer lab teacher at the time the iPad wasannounced - and the announcement created a huge buzz amongst mystudents. When the iPad was released in the US but not (at the time) inCanada, there was disappointment but even more buzz - I helped a groupof students print out a paper cut-out iPad - glued onto cardboard, theygot to parade around with their own (faux) iPads prior to availabilityin Canada. When they were finally released in Canada, I didn't line up onrelease day, but I did pick one up from a local Apple retailer laterthat weekend. By then (48 hours after release) they only had stock ofthe most expensive model - 64 GB storage, WiFi + 3G - but's the modelthat I wanted anyway. I took it to my elementary school and let students line up to get3-5 minutes hands-on time with it. For a while, I suspect I was themost popular teacher in the school. For me, one of the best features of the iPad (though an optionalone) has been little commented on - and that's that (at least for the3G models) Apple was able to get the various mobile providers - in theUS, Canada, and other countries - to offer data packages withoutcontracts and with starting prices lower than for most otherdevices. As a result, while I am mostly able to go online using WiFi - athome and out and about - I have a $15/month data package that ensuresthat I'm connected everywhere else as well. When I need it, it's anincredible convenience. I don't have a mobile phone, but with Skype on my iPad,I'm able to make calls wherever I am as needed, for instance. I've chatted with mobile provider folks (up to vice-president levelexecutives), and they all deny that Apple put any pressure on them, butthey still don't match iPad data prices for any other devices - whethersubsidized by a fixed contract or purchased by the end-user. There's astory here, but I don't know what it is! Jason Schrader (Maximize YourMac): I just want to say that I cannot wait to buy an iPad 3! My daughter (who is 3) is an absolute wiz with an iPod touch and Icannot wait to see what an iPad brings for her. Austin Leeds (AppleEverywhere): My iPad has been quite possibly the best investmentI've ever made (I hope my newly-acquired 1987 Buick LeSabre T-Type canat least stand somewhere in the shadow of my iPad's usefulness). Fortwo years, it's been everything from tuba to email machine to photoediting platform (I still see the iPad's intuitive and surprisinglynatural interface taking over a lot of photo editing from traditionaldesktops once its graphics capabilities reach a higher state ofevolution) to oversized portable gaming console to digital pictureframe. I plan on buying an iPad 3 once they are released, regardless ofwhatever new features are added, whatever advancements are made, andwhatever the critics say. But I'm still keeping my iPad 1. Two iPadsare always better than one! I found the iPad 2 less compelling - a not particularly good camera(in a form factor that's awkward for taking pictures) along with afaster processor and more RAM. A faster processor and more RAM arealways welcome, but I still haven't found either processor speed or theamount of RAM (a relatively paltry 256 MB!) in the original iPad to beconstraints in anything I'm doing. At the same time, if the rumoured 2048 x 1436 pixel Retina Displaycomes to pass on the iPad 3, I wonder whether that will work well. Thecurrent 1024 x 762 is workable on the 10" screen - quadrupling thenumber of pixels risks making things like web pages unreadable due totiny type. Yes, screen magnification is just a gesture away, but havingto do that routinely on every new web page could - I suspect - gettedious fast. Anyway, we'll have to wait and see on that one! Brian Gray (FruitfulEditing): Last year my wife purchased an iPad 2 for herself to useinstead of her aging 12" PowerBook. Itried to convince her that this would not be an adequate replacementfor a regular computer, but she went ahead anyway. I was sure the iPadwould fail to meet her needs. ...this is the computing device she was destinedto use all along. Well, I can admit when I'm wrong. It turns out this is the computingdevice she was destined to use all along. I've also been evaluating myown computing needs and am starting to question if an iPad with aBluetooth keyboard is all I need for 80% of the time. Product names aside, does anyone else think the iPad is destined tobecome the ultimate low-end "Mac" ? Austin Leeds: I think ultimately, the iPad willindeed become the ultimate low-end "Mac". As far as price goes, it's alot less expensive than its laptop brethren of similar capabilities,and it has the advantage of current support and good partsavailability. I plan to add a new battery to my iPad 1 when the timecomes. I'm fairly certain the iPad just kicked the 12" PowerBook G4 off itscoveted "best portable low-end Mac" throne. Sure, the 12" PB G4 canstill do some things the iPad can't, but they can go toe-to-toe inprice, the iPad's battery lasts a lot longer, and it seemssubstantially easier to repair, if you know what you're doing. Charles Moore (several columns): I agree that the iPadseems as if it's been around longer than two years. It's one of thoseinnovations, like, I guess, the Internet itself, that becomes part ofthe backdrop of day-to-day life. I resisted the iPad for more than a year. I didn't liketouchscreens, and I still don't after seven months of iPad usership,but the 'Pad has become so integrated into my diurnal routines thatusually the first thing I do upon awakening is to grab the slab tocheck the weather, my main email accounts, and the morning news.Likewise, a similar routine before I retire. That said, I am far from being an unalloyed iPad aficionado. There'sthe aforenoted aversion to touchscreens, but my biggest beef with theiPad is the iOS's boneheadedly lame facility for working with text,which is my stock in trade. Actually, both objections are differentfacets of the same issue. Without the positive electromechanicalprecison of mouse and cursor input, I feel like I'm trying to play thepiano while wearing wooly mittens. Photo editing on a touchscreen? Notmy cup of tea. I want my mouse! All that would be bad enough if it was all I found uncongenial aboutiPad computing, but unhappily it isn't. I also profoundly missmultitasking, and what's purported to pass for it in iOS newspeak is abad joke (see How iOS MultitaskingReally Works on Macworld for details on how it does - or doesn't -work). I also detest full screen application interfaces, find theincapacity to have multiple document and/or application windows opensimultaneously a horribly constipating workflow bottleneck, and loathlosing the degree of control one has with a document- and folder-baseddirectory file system interface. And don't get me going about Apple'sperverse refusal to equip the iPad with a real USB port, and preferablya card reader. PC tablet makers do it, so don't say it's physicallyimpractical. The iPad is also hamstrung from becoming a satisfactorylaptop substitute due to the iOS's non-support of Flash. Say what youwill about Flash's shortcomings, there is still a lot of Flash-basedcontent out there on the Web, and some of it is mission critical for meat times. While some of these angularities and deficiencies can be workedaround (not Flash support, alas), I like Cnet's Scott Stein's analogy: "I could go grocery shopping on abicycle, but it doesn't mean it's as easy as using a car." Touchscreen input vagueness evidently doesn't bother a lot of iPadusers, including some of my esteemed Low End Mac colleagues, but itinfuriates me, and indications of not only Apple, but Microsoft aswell, being both seemly bent on importing touchscreen-oriented userinterface conventions to their respective desktop operating systems ismaking me apprehensive. ZDNet's David Morgenstern is likewise concerned, observing in a column this week that manylongtime professional users of the Mac are worried - very worried - bythe smoke signals coming out of Cupertino and what appears to beApple's wavering commitment to technology that supports its creativeprofessional market. He cites several worrying signs, including theiOS-ification of the Mac OS, which he says (and I agree) is dumbingthings down way too far. He cites a a rumor floating around thedeveloper community that Apple wanted even more iOS integration inLion, the objective being a single OS that will run on handheld,tablet, and portable/desktop. "This would be a disaster," he contends.I couldn't agree more. As Morgenstern observes, not everyone is aconsumer market or enterprise customer. 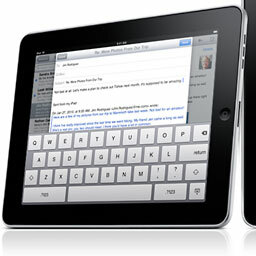 Oddly, one iPad aspect I don't dislike as much as I thought I wouldis the virtual keyboard. I'm certainly not in love with it, but I findit relatively tolerable compared with the aggravations and frustrationspreviously listed. I've experimented with pairing a Bluetooth keyboardwith the iPad, but doing that eliminates one of the slab's cardinaladvantages - its comfortable and relatively effortless portability. Forexample, I'm typing this column right now relaxed in a comfortablechair beside the wood stove, instead of in my task chair in front ofthe Mac in my office. Has the iPad changed my life? Yes. I have to admit that I would missit, a lot, if it were gone. However, it hasn't uncomplicated my life,arguably the contrary in adding another layer of complexity, to saynothing of more expense, and another machine to sync with my threeproduction Macs. I will definitely be skipping the iPad 3, even thoughthe expected higher-res camera would be nice to have. I have nocomplaint about my iPad 2's liveliness, and I'm not at all sure that ahigher-resolution display would benefit my 60-year old eyes. So, despite its admitted virtues, the iPad is definitely not "theanswer" for me - at least not at its current stage of development. Theideal for me would be a machine that combined the lightweight easyportability and instant wakeup of the iPad along with its admirablebattery life, with the power, versatility, precision input, fullmultitasking capability, connectivity, and data storage capacity of alaptop computer. Is the iPad worth the stiff cost of entry? At least not for me andmy needs, compared with the value of, say, an Apple Certified Refurbished (ACR)MacBook Air, or even a new one, despite the fact that the lattersells for twice as much as my 16 GB WiFi iPad. For example, an ACR11.6" Core 2 Duo Air with a 128 GB SSD can be had for $799, or $100more than the price of a 64 GB WiFi iPad. In my estimation you'regetting way more machine and much more than $100 greater value in theAir than you would with the iPad. The more expensive iPad models make even less economic sense to me,unless, for example, you really need 3G connectivity (Dan Bashur makesa good point about economical 3G data service, but there's no 3G at allavailable in my neck of the woods) or more storage capacity, but eventhe base MacBook Air has the same room on its SSD than the mostcapacious iPad. MacBook Air? The 11.6" Air probably comes closer to an idealcompromise than anything else available at the moment, although notperfectly. You're still limited to a maximum of 256 GB of storage, andthat at a stiff price, and RAM maxes out at a likewise expensive 4GB. I consider iPad is more of a convenience and a toy than a seriouswork tool, at least for content producers. I enjoy having mine, but Icould certainly get along without it, especially if I had a MacBookAir. What worries me these days is that I might discover that I stillwant both!